My wife and I built a new home and moved in January 2017 and bought a new Whirlpool Cabrio Washing machine, model number WTW8000DW and it is making some weird noises, sounds like a bearing issue to me. Seeing that we are just over the one year mark. I am inquiring to see what Whirlpool can do as we are very disappointed that we are having issues right now. We purchased in January 2017 and it was delivered in February 2017. I don't plan on doing work myself. The washer is washing clothes just fine. It just sounds really loud like a mini jet engine during the spin cycle. Hello, I'm Ray and would be happy to help you.. that is a issue they have with that model.. It is either the gear case or the clutch that is faulty..
#3 and #19 it's a major repair.. are you doing the work yourself? Well that really stinks after only owning for 13 months. 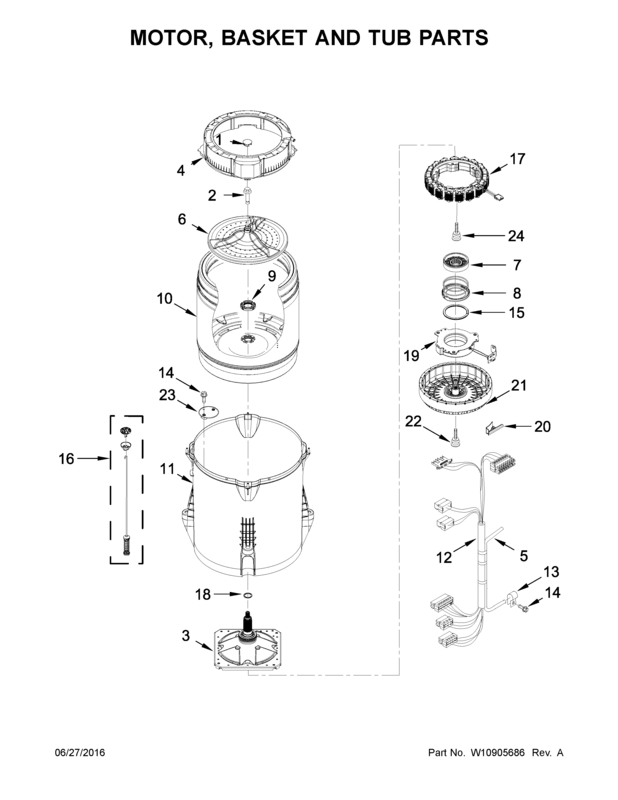 Are those parts only warrantied under the 12 months or is that some thing Whirlpool will send to me for replacement? Thanks. you only have 1 year manufacture warranty.. Did you buy the extended warranty on it? We did not buy the extended warranty. Do you know if Whirlpool will send me the parts at no charge? you can try but I seriously doubt.. they are idiots about that. hello. how did you do with the machine? I am in the process of contacting Whirlpool on the parts now. I do plan on trying to fix the issue myself. Looking back on my original question, I believe I had my model number wrong, I believe it is W10607424B, not sure if that changes your prior answers or not. We have a Whirlpool Cabrio Model WTW6800WL1 (bought in 2009). I have a three year old Whirlpool Cabrio top loading wash machine.